NOTE: Capita SIMS .net requires Microsoft Office Products for reporting, it is therefore the responsibility of all schools to ensure that all users and devices are covered for remote use rights by having a valid Microsoft Office 2016 Licence (Standard Edition Minimum). Visit The Hosted Connector download page and double click the green icon with the two white arrows to download the connector. Depending which browser you are using, the connector will start to download at the bottom of your screen. Double click after the download has completed. When this screen appears, click Next through the installer until you reach the Finish page.Double click after the download has completed. The icon will now appear on your Desktop as it would in school. Login using your Hosted credentials and you should be able to access the service. If you are taking your school PC home, this should allow you to login using the same icon as you would in school reliant on your Internet connection at home. 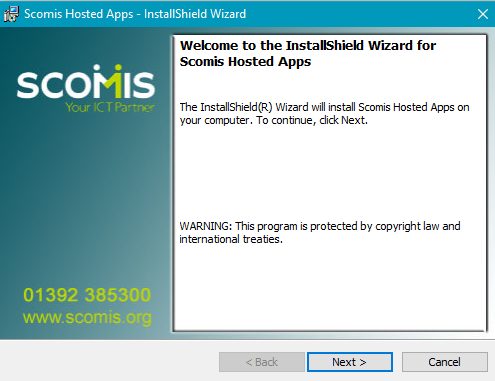 ****Please note, Scomis are not able to provide support for Home/Personal PC’s*****. Posted in Hosted SIMS and tagged connector, download, home, remotely.